A Grinch appliance test on a Rick Baker lifecast with a Grinch foam form from Ron Howards family comedy How the Grinch Stole Christmas. The appliance test is an unfinished foam latex appliance that covers most of the head and face except for the top where hair appliances would be added. 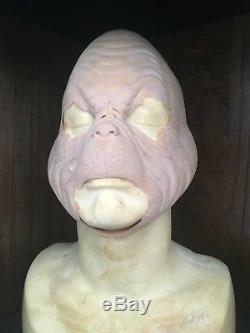 The piece features much of the familiar Grinch skin and texture detailing, though it is applied to a lifecast of Rick Baker rather than Jim Carrey. This would have been performed early in the creative process to reach a consensus on the final aesthetic. The foam form is a biscuit foam cast of Carreys classic character that would have likely been created for hair or make-up tests. The appliance test featured bits of untrimmed flash throughout and areas where the latex has fallen away, particularly near the mouth, but remains in fair condition. The foam test bust remains in good condition. Appliance test dimensions: 8 x 13 x 14 (20 cm x 33 cm x 35 cm); foam form dimensions: 10 x 7 x 14 (25 cm x 18 cm x 35 cm). The item "How the Grinch Stole Christmas Movie Prop Life Cast Test Prop Movie used worn" is in sale since Wednesday, October 17, 2018. This item is in the category "Entertainment Memorabilia\Movie Memorabilia\Props\Originals". The seller is "wweaxxess" and is located in Bridgewater, New Jersey. This item can be shipped to United States, United Kingdom, Denmark, Romania, Slovakia, Bulgaria, Czech republic, Finland, Hungary, Latvia, Lithuania, Malta, Estonia, Australia, Greece, Portugal, Cyprus, Slovenia, Japan, China, Sweden, South Korea, Indonesia, South africa, Thailand, Belgium, France, Hong Kong, Ireland, Netherlands, Poland, Spain, Italy, Germany, Austria, Israel, Mexico, New Zealand, Singapore, Switzerland, Norway, Saudi arabia, Ukraine, United arab emirates, Qatar, Kuwait, Bahrain, Croatia, Malaysia, Brazil, Colombia, Panama, Jamaica, Barbados, Bangladesh, Bermuda, Brunei darussalam, Bolivia, Ecuador, Egypt, French guiana, Guernsey, Gibraltar, Guadeloupe, Iceland, Jersey, Jordan, Cambodia, Cayman islands, Liechtenstein, Sri lanka, Luxembourg, Monaco, Macao, Martinique, Maldives, Nicaragua, Oman, Peru, Pakistan, Paraguay, Reunion, Bahamas, Viet nam.